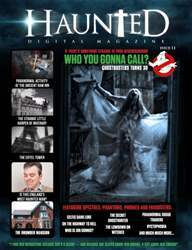 Well here it is - Issue 3 of the world's only online digital magazine that takes a fun and fresh look at all things scary, spooky and ghostly blending both the paranormal and horror worlds fusing them to become one. Priced at just £1.99, no other magazine can match us for quality and quantity. We've got them all - zombies, vampires, ghosts, monsters and aliens all feature in the magazine and they rub shoulders with celebrity interviews, film reviews, historical features on legends of old. We even have our first world exclusive - interviews with the cast of brand new ITV2 comedy drama "Switch", the amazing Soska Sisters who wowed Film4 Frightfest with their second feature "American Mary" and plethora of interviews from some amazing people. There is something for everyone, your very own slice of paranormal pie with a good old dollop of horror thrown in for good measure. Buy it, ENJOY IT and thanks for your support!